Debate Thread: Is Maxis in the MPD? One of the biggest mysteries of BO3 is the presence of one Ludvig Maxis. It is clear that he is ethereal which we can speculate as because he is at the root of the flytrap Easter egg in "The Giant", so that is not in question. We also hear him discussing the end of a dimension through a portal in Shadows of Evil. Dr. Groph: Despite the fact that all testing of the MPD has been put on hold, we have nonetheless observed a series of unprecedented and, dare I say it, erratic behaviors exhibited by the pyramid. Comms, interference, and power outages have become common place, with many fearful for their own safety. The perimeter guards on the Exclusion Zone have reported hearing voices emanating from the MPD, though external recordings do not corroborate their testimony. Several individuals reported hearing the same exact words: I must go to her; the loop must be closed. While most accounts claim that the words were spoken by an unidentified individual, several seem to believe that the quotation came from Dr. Maxis. That, I know is not possible. Such is the increasing atmosphere of paranoia that we have taken to ensuring the placement of survival suits throughout the facility, just in case essential life support systems should fail. It seems to me that Dr. Maxis COULD very well be in the MPD. As you can see, Schuster and Groph have constructed a device which can interface with the MPD and allows them to use a sample, of what we can presume is maxis, to not only locate the good doctor, but teleport him to the Moon facility as well. From this we can infer that the MPD has the ABILITY to teleport objects from ANYWHERE. If this is true, is it out of the realm of possibility this same device can create portals as well? Bare in mind that these current events are all taking place before any sort of world-destroying rift-event is even heard of, so unlike the current state of things, the universe isn't falling apart yet, which according to Richtofen is a major component as to the "Aim" of whatever teleports them from place to place. -The ability to teleport people from place to place. However, when maxis takes control in Buried, it appears the zombies have an ORANGE eye color, not a YELLOW eye color that we see in BO3. Is it possible maxis is IN the MPD, but doesn't have control over the zombies for some reason or another? I've also devised theories relating to the Kronorium being the "one true MPD" and the summoning key being the "Moon artifact" to that one true MPD, but that drags into my own groundless theories and away from the topic. There are a LOT of angles to look at this from, so I've decided to host a debate thread. Is Maxis in the MPD or not, and why so? Such as Buried, Maxis isn't physically in the MPD. Notice that many of the things you listed would imply he has transdimensional influence, not just local. MPDs only have influence within their local dimension. Additionally, if Maxis was on the Moon, just as in the Original universe, the PA system would have notified Groph of an intruder in the Recieving Bay, and Maxis would no doubt have been seen entering it by Groph himself, not to mention security staff. Conclusion: the MPD was unoccupied until the Keeper entered. Actually, the zombie eye colours in BO3 are more orange then yellow to me. But somehow I still think Maxis isnt in the MPD, I dont know why, but I just dont think so. I mean, maybe this is just one of the rewards that Samantha promised in Origins? He goes into the light, and according to the ZNS radios, it sounds like he has a new body by the Origins Ending Cutscene. But, he can somehow communicate across dimensions, so maybe he could be like Richtofen in his Buried End Game, where he has a physical body, but is somehow still in the Aether. After the Keeper is defeated, if he dies and evacuates the MPD, you would have to completely recharge the MPD just to open it, then have a bit of Maxis DNA to bring him to wherever it was located. But when we return, it's closed, so Maxis could not have gotten inside. On that note, we ought to also observe that only one entity can occupy an MPD at a time. There are two entities when Samantha occupies it, however, correct? We have reports of people hearing maxis from near the MPD. They don't include details like that for sport. I think the machines were ready and Maxis wasn't in the MPD, but his voice was just emanating from it. As if he was somewhere higher and could use that to channel a message, or something like that. (@NaBrZHunter introduced me to this idea). I think that the Kronorium, is not a book, but a sort of "Master MPD" that controls the MPDs in all realities. Maxis isn't in the MPD, but the Kronorium, controlling all MPDs across all worlds. The summoning key, is the same as the moon artifact from MOON, but is meant to work with the Kronorium, not the average MPD, thus, that makes it the strongest artifact in any universe. However I have no real evidence to back this up so it's just a thought at this time. His multidimensional influence could possibly stem from the rips in the time space continuum. He has somehow managed to find a way to communicate through these rifts, into other dimensions that Richtofen currently resides in. How he is accomplishing this communication could possibly be with the use of 115 and the teleporters. Opening a teleporter rift and speaking directly through it to the locations of Richtofen. Sitting back in the original universe, there still needs to be a way back to fix everything that has broken these multiple dimensions. I think we may have seen the last of the MPD. Throughout the script, however, the teleporters remain a constant. Could this be possible??? And how does Div9 fit into all this??? Maxis at least has the ability to transport the group. Dempsey says (paraphrasing here) to Richtofen during ZNS "Hey Richtofen, why don't you tell your pal Maxis to drop us off closer to the location next time". So it seems he has power, but whether that's Aetheral power or something else? Maxis was killed in front of the MPD. Somehow his soul remains on the Moon for when the O4 get there, he gives them instructions via the computer at the spawn room. He then asks us to receive the "egg artifact", stick it in the MPD to power it, then 'secure' it by using a Gersch device on it to bring it God knows where right before he betrays us by blowing up the earth. Then, Maxis' communications can suddenly be heard over pretty much all the earth as he guides the N4 to power up the towers rescue his daughter. We always assumed Maxis' soul was trapped into some computer at Moon or the MPD. We also didn't know anything about this egg aside from the fact Maxis did research on it prior to his death according to Samantha. Now we know that the egg has been in fact the Summoning Key all along. And what is the Summoning Key capable of? Holding people's souls. So, Maxis is in the the summoning key, and we use it's power to teleport through dimensions, time and space. I can get behind that. Sitting back in the original universe, there still needs to be a way back to fix everything that has broken these multiple dimensions. I think we may have seen the last of the MPD. Throughout the script, however, the teleporters remain a constant. Could this be possible??? And how does Div9 fit into all this??? Can you elaborate further on this section? I apologize but it confuses me. I'm gonna challenge your last sentence about the Moon egg/orb being the Summoning Key. There just isn't any evidence to suggest that this is the case. @Stop Mocking Me0's theory that it's the egg for some grand MPD is possible, but beyond that I don't think so. What evidence is there to suggest that Dr. Maxis is in the Summoning Key? Well it would explain why MAXIS's soul out of all that were sacrificed maintained influence after death. Absolutely not. I can say with nearly full certainty that the summoning key it's self is incapable of crossing dimensions, and I'm fairly certain it's not capable of ripping time and space either. I can say with nearly full certainty that the summoning key it's self is incapable of crossing dimensions, and I'm fairly certain it's not capable of ripping time and space either. What do you mean the Summoning Key is incapable of crossing dimensions? 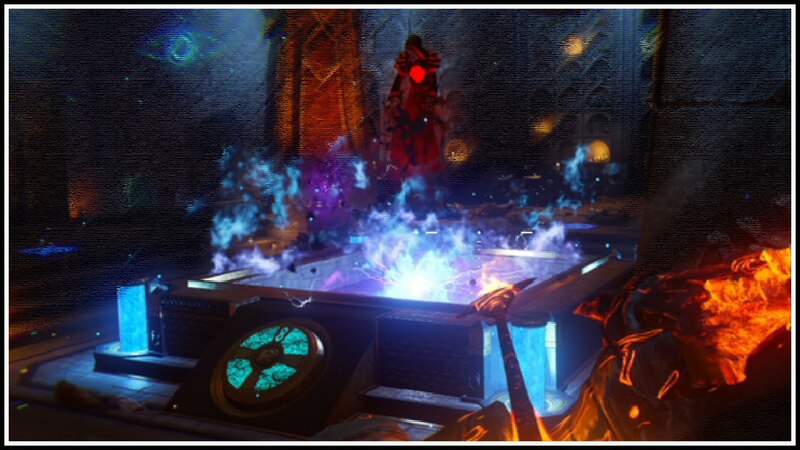 We have seen it cross dimensions, from Shadows of Evil to The Giant. If we want to say they're the same universe, that's another debate entirely. However, on a conceptual level, I don't see why the Key couldn't move across dimensions. The key can not create portals by it's self from one dimension to another. It can be brought through by other means. If we are theorizing how it is Maxis is communicating with the O4, then why not suggest that Maxis is still in the original universe communicating via teleporters? Why is it, just because one universe of Maxis dies, another one, such as Richtofen's character, can't still be pulling strings. I was under the impression that this was multidimensional, right. There could be so many different solutions, I am just throwing ideas out. Regardless of how we are recieving instructions, a form of teleportation is a medium used in every title of the Black Ops series. It has to be an important piece of the puzzle for them to highlight and bring it back in the "Giant". Just for clarification's sake when referring to the "teleporters," do you mind calling them rifts? I keep misunderstanding you haha, I'm sorry. Well because I don't think the original Maxis is the one directing the Origins 4. It seems as though the Quadrotor Maxis from Origins, who ascended to a higher place through the portal and is now "immune" with Richtofen, is the one calling the shots. With that said, we have no idea what original Maxis is up to. He attempted to enter Agartha in Buried (and perhaps succeeded in doing so), so I mean maybe he's M! But, I think this shows that he's not the one giving orders to the Origins 4. Sorry, Rifts make life easier. I am in concurance with the immunity, but in this new map, there has been a reference to the immunity possibly wearing off or not being permanent. I don't have the actual quote on hand and would surmise that you have it within your ciphers/quotes thread. Since there is speculation that their immunity could be temporary, what could be the implications to Maxis and Richtofen. Now it seems like they are racing the clock.